In Secrets of the Trading Pros, Jack Bouroudjian shares the wisdom of successful traders who served as his mentors, and at the same time reveals his broad knowledge of market structure and the forces that make markets move. He views trading as more of an art than a science and explains why respecting the market at all times is one of the most important lessons any trader can learn. 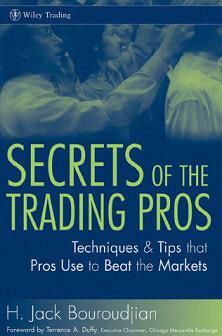 Secrets of the Trading Pros is written in a narrative style that makes readers feel as if Bouroudjian were sitting across the table sharing trading anecdotes and offering insights into market fundamentals. The book discusses the benefits of knowing the market and understanding the various players in different industries.Secrets of the Trading Pros serves as an easy-to-read guide that can help traders weed out the bad trades from the good and become more successful overall.